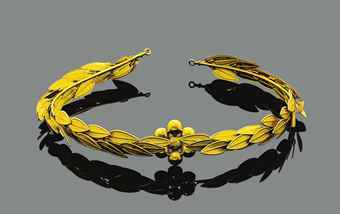 There were many popular motifs during the Georgian era (1714-1837) , many of which were traditional from prior to the Georgian era and also continued to be popular through subsequent eras and are still worn today. 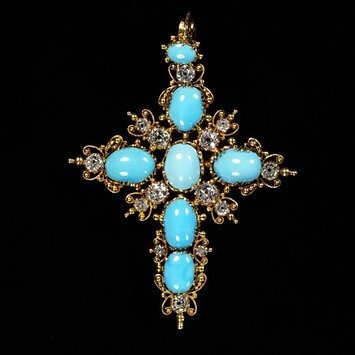 However, there were certain jewelry motifs during the Georgian era which were particularly recurring. It may be that I have missed one or more, in which case I will be returning to this post to update. Also, as I find representative pictures for more of the common motifs, I will add them. 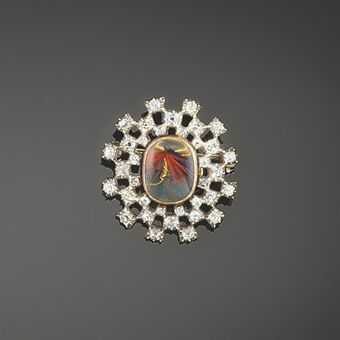 With the new interest in astronomy, these cosmic themed motifs became popular. 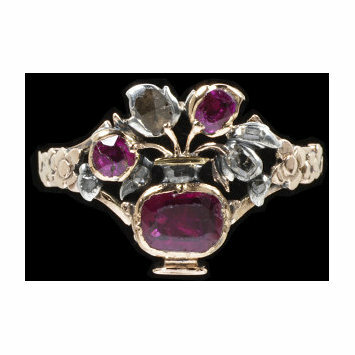 Naturalistic jewellery, decorated with realistic flowers, fruit, leaves, plants or feathers, appeared in the early 19th century along with the ‘Romantic’ movement. Particular meaning was often attached to specific plants. Bows, garlands, ribbons and scrolls were a regularly repeated motif. which was very popular in the Georgian era. 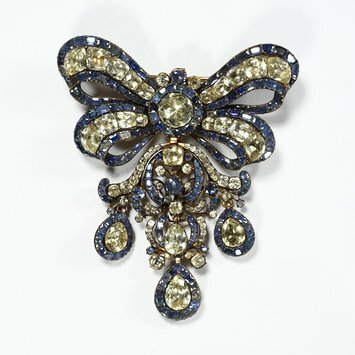 Girandole bow bodice ornament and pair of earrings set with topazes,backed with foil, and sapphires. 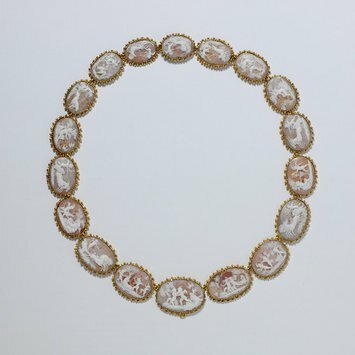 All the stones are set in gold. 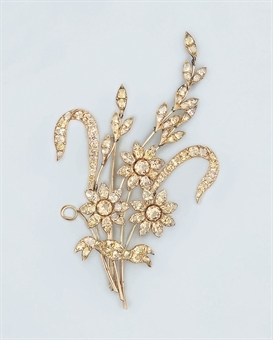 There is a great deal of surviving mourning jewelry from the era. Many of the motifs were urns, Neo-classical plinths and obelisks, weeping willows, angels, cherubs, names and dates of the dead and portraits of the dead. Often these motifs were incorporated into locks and medallions. Hair work was often incorporated in a variety of forms. ‘Memento Mori’ means ‘remember you will die’ in Latin and people of the era would wear skulls and coffins to remind themselves. Motifs used in love tokens included cupids, doves, the ‘altar of love’, butterflies, romantic messages, initials and names. 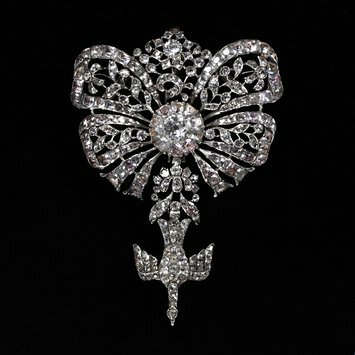 Also the ‘crowned heart’ was popular, signifying a lover’s rule over the heart. Sentimental message were also conveyed using the initial letter of each stone in the design. This is referred to as ‘acrostic’. 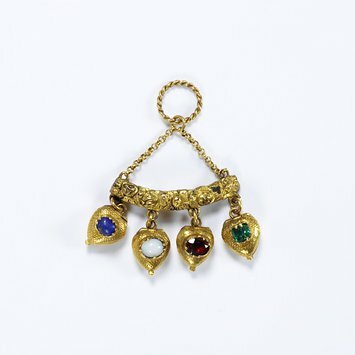 This particular pendant below has the stones of Lapis Lazuli, glass in imitation of Opal, Vermeil ( the old name for garnet ) and Emerald which spell LOVE. ‘Giardinetti’ (from the Italian, meaning ‘little garden’) was another popular theme. 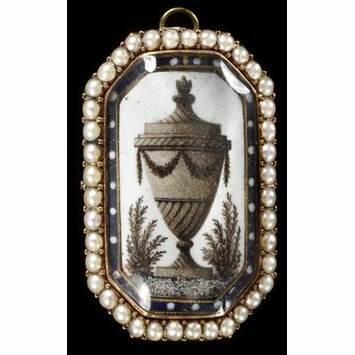 A giardinetti piece had tiny flowers arranged in a vase, pot or basket, usually made from precious stones. Also stylized flowers without vases or pots or baskets were often seen. Hands, singular or clasped, were another recurring motif. 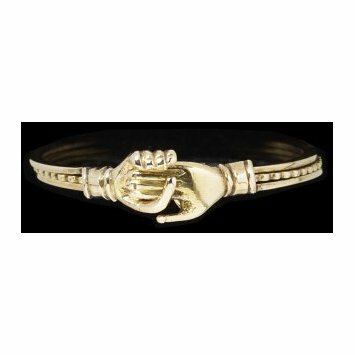 The hand motif has long symbolized a multitude of things, including affection, loyalty, solidarity, family and love. 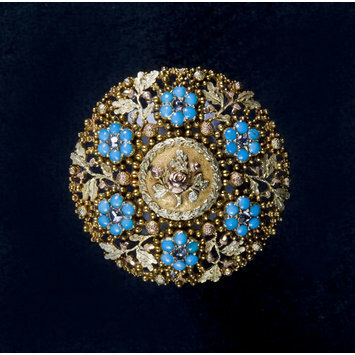 This ring may once have been owned by George IV (1762-1830). He may be wearing it in a portrait by Sir Thomas Lawrence in the Wallace Collection (559). 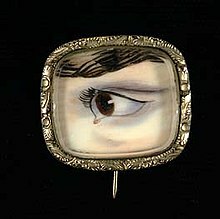 Popular from the late 1700s, Lovers’ eyes were miniatures, normally watercolour on ivory. They depicted the eye or eyes of a loved one or family member. 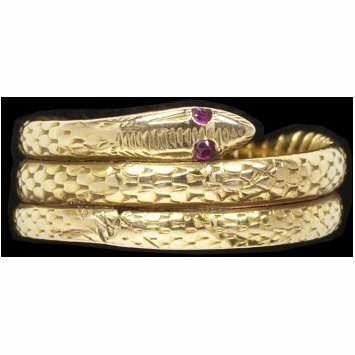 They were worn as bracelets, brooches, pendants or rings. Miniature portraits were also popular. 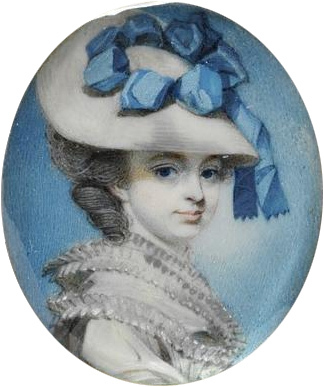 Miniature portraits were often worn as brooches or inside lockets. 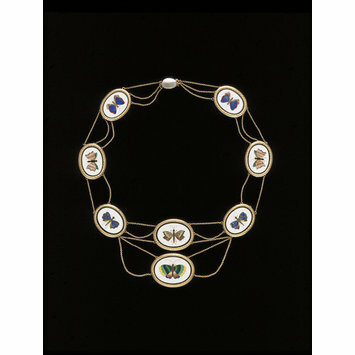 Between the years of 1800 to 1889, there were a number of important archaeological findings which greatly influenced jewelry design. These included Egyptian, Etruscan, Greek (Hellenistic) and Roman.